Why A Law For The Dead? It is not so much a loophole as a conscious decision by lawmakers to avoid doing the right thing. In order for it to be a legal loophole there would first have to be a law. The absence of this law provides immoral profit for some, a perverse entertainment for many and pain for others. Michael Jackson continues to be one of the hardest working persons in the entertainment business. The US Courts and Government are in agreement he is enough of a person to continue to produce material; be a part of that material; go on tour; be sued; taxed; hire contractors and employees through representation. But he is no longer a person when it comes to getting justice for slander against him. Michael Jackson is not alone when it comes to this. It happens to persons known the world over and those only known in their hometown. All these people are equally important. If a decedent can be sued for slander which may have happened while they were alive, have the case against them handled by family or estate managers then why does it not work in reverse? The biggest argument against this proposed law is it will violate our First Amendment rights. 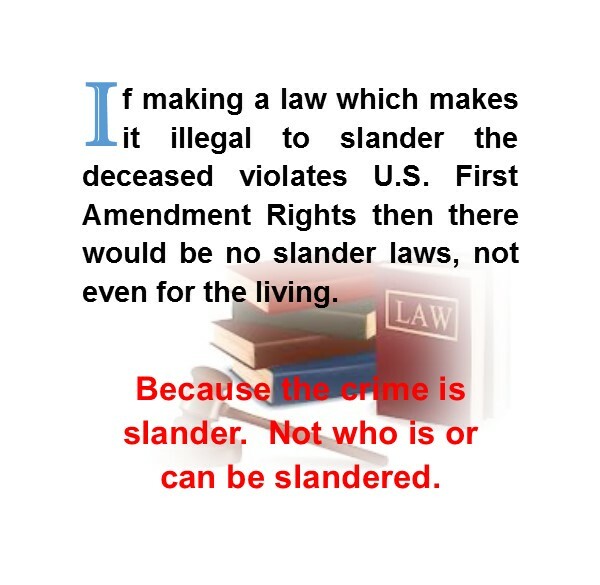 If making a law which makes it illegal to slander the deceased violates US First Amendment Rights then there would be no slander laws, not even for the living. Because the crime is slander. Not who is or can be slandered. Contact the lawmakers and tell them you support the proposed law and want them to do the same. It’s NOT about WHO THOUGHT OF IT FIRST. It’s NOT about who gets the CREDIT. 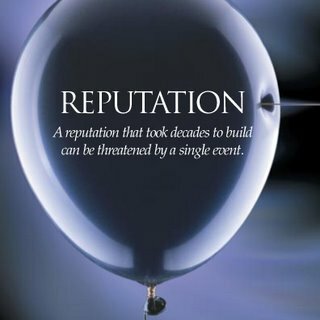 There has been an orchestrated plan to destroy Michael Jackson’s reputation since 1993, and it has NOT STOPPED even in death. WHEN WILL IT STOP? It won’t unless we ask our two U.S. 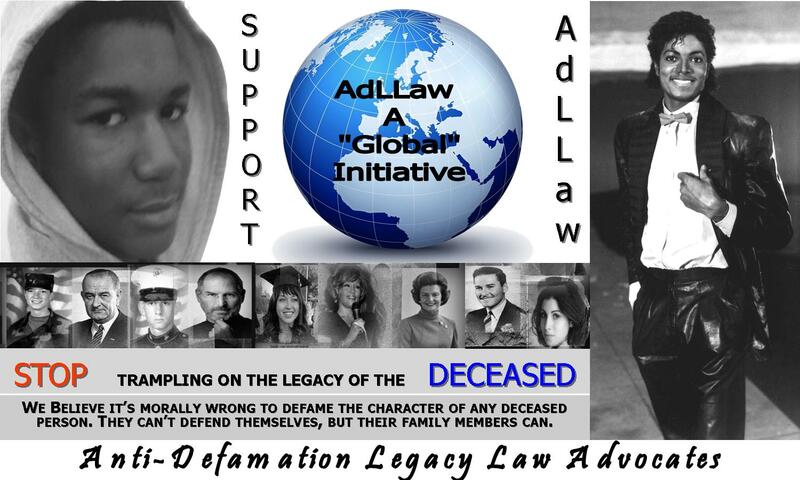 Senators and the President of the United States to support the #AdLLawInitiative by authoring and passing a law; to give the family members of the deceased a law to sue those who defame their deceased relatives. The beautiful photos are NICE. The projects are BEAUTIFUL and well deserved, but they won’t mean a thing if the general public, globally, continue to believe that Michael Jackson was a child molester; that Trayvon Martin’s death was a good thing because he was a gangster; that former First Lady Betty Ford was a whore; that God hated Steve Jobs, Marine Lance Corporal Matthew Snyder, Army Spc. Carrie L. French and Whitney Houston was a “crack-head whore” as well as some other horrific things many of the deceased has been named since their death. Robson’s lawyer also mentions a psychiatrist who treated him — the doctor is a leader in the field of child psychology. NO OFFENSE TOWARD THOSE WHO ARE REAL VICTIMS, BUT IS THIS REALLY A COINCIDENT? CA SB 131 was amended on May 2, 2013; one day after Wade Robson filed his claim and the bill is amended to read what Wade Robson needed to file a late claim. This bill should be enforced for those who sincerely need it but not for anyone to file bogus claims. This is really a tender situation for those who are REAL victims. 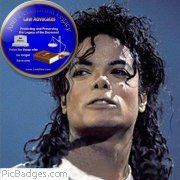 It is very difficult to attack a bill that should have been enforced a long time ago, but really Wade Robson. I support this bill but I do NOT support those who use something worthy for financial gain because they can. This bill is intended to support REAL victims. Conveniently, Mr. Robson did NOT remember being molested as he was the “Star” witness for Michael Jackson’s defense at the 2005 trial. Many of us are well acquainted with being molested, as children and adults, and we support the amending of this law and the victims, but we cannot support those who use something intended for real victims to benefit those who use it for financial gain. There is no “Magic Wand” to make this disappear and it won’t go away because YOU choose to ignore it. WE have to come TOGETHER to make this happen or at least make a mighty loud noise about it. We must support the victims of abuse but, at the same time, oppose those who will use this law to defame someone who is NOT here to defend himself. 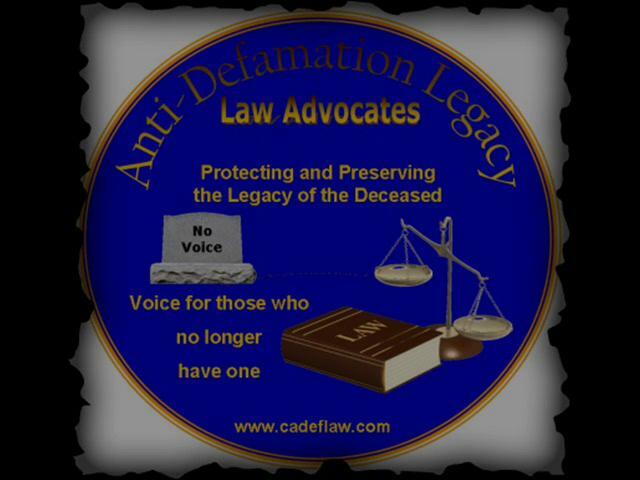 The Anti-Defamation Legacy Law Advocates (AdLLaw) is a non-profit, charitable and advocacy organization which wants to have a U.S. law passed allowing for family members of defamed deceased people to sue for civil damages. Even the non-famous can be targets which mean that we and our loved ones are at risk. The law protects the likeness and image of a person dead or alive, and the same should hold true for their reputation. Many countries have working laws against defaming the dead so why not the USA? This is not a new subject. In the USA such a law has been vigorously fought and lobbied against. (5) Even with the understanding that not all cases will fall under legislative guidelines; as defamation nor will all successors be willing or able to sue. Knowing defamation suits are hard fought and not easily won even for the living there is great resistance to passing this law to protect the legacy of the deceased. Until the United States of America, a Nation which considers itself a world leader, is willing to step forward and lead by example then it says we only honor our dead in word, but not in deed. 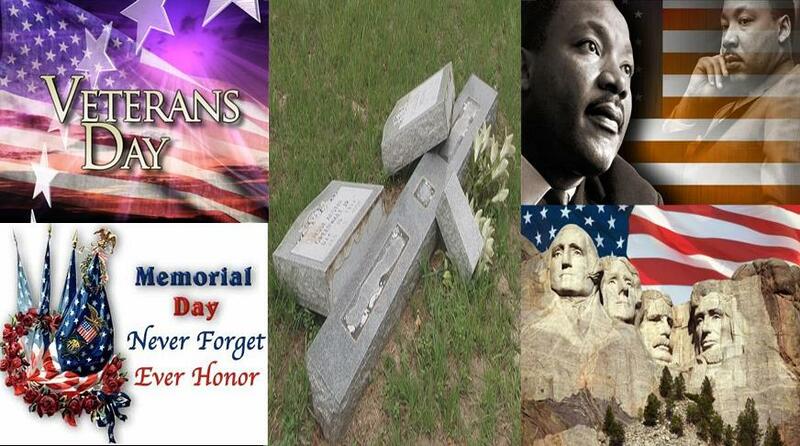 The truth must be told and our history needs to reflect that, but there is no honor in slandering our dead. 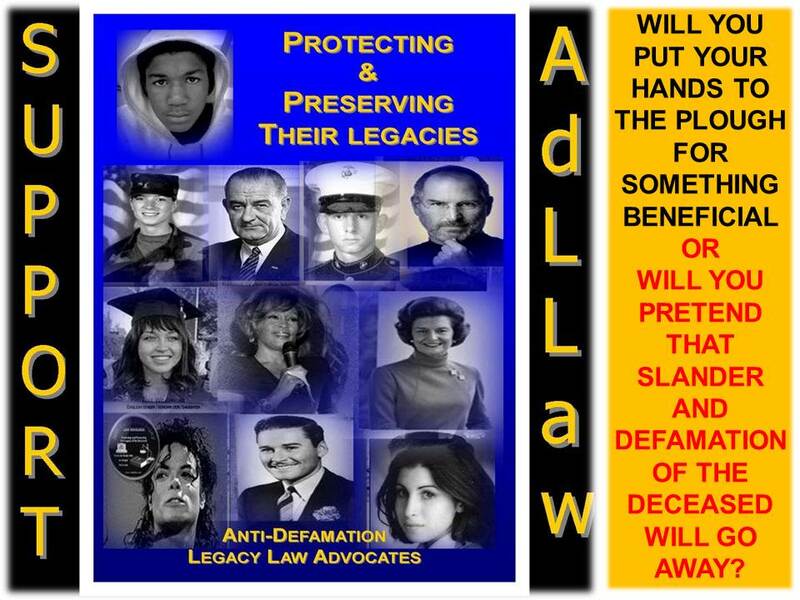 Please sign the AdLLaw (Anti-defamation Legacy Law) Initiative Petition. Support the AdLLaw Initiative by contacting your U.S. House Senators and the President by letter or email. Non U.S. persons contact the President. Simply tell them you support the AdLLaw Initiative and would like for them to do the same. Then copy and paste this link to your letter or email. WE are asking the U.S. Senate to adopt and support The Anti-Defamation Legacy Law Initiative (AdLLaw) (pronounced Ad-Law). The Initiative’s goal is simple. It is meant to bring about legislation which will include the deceased among those who, when defamed, can have the same legal protection by giving their family a statute upon which to base a civil cause of action. We see this law as any other; a possible deterrent for most and a tool for the more serious offenders. Originally we thought to start with California. The California Courts Judicial Council created a draft Initiative. Although, prepared for California, the language of the document clearly states our intention. A MoveOn.Org petition has been created, hoping to show our political leaders this is something the people wish to see happen. We hope it will make deciding to adopt or support the proposed legislation a bipartisan effort. There is a long list of decedents who have been egregiously defamed throughout history. 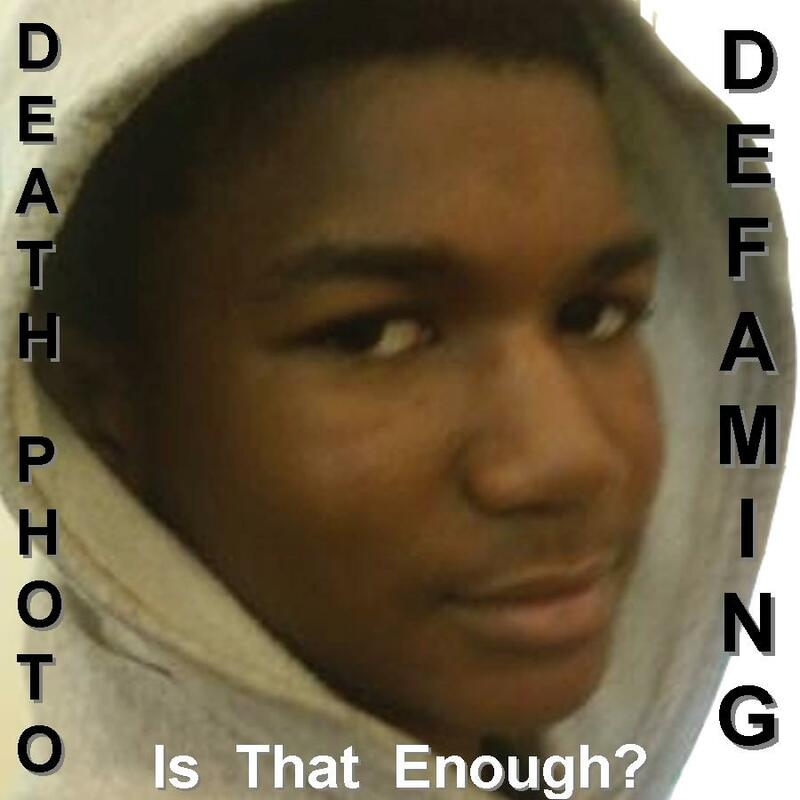 Trayvon Martin and Michael Jackson are but the latest victims of defamation. Trayvon’s character is determined by gold teeth caps, a hoodie, his age and ethnicity. His legacy becomes a death made mockery for profit and agenda using a shooting range target and garment created for ridicule, and ratings by way of a death scene photo. We are all familiar with the level of unfair media attention heaped upon Michael Jackson in the past; there is no need to reiterate it here. Journalists hid behind freedom of speech in an attempt to destroy Michael Jackson for entertainment and profit. Michael Jackson devoted his life to demonstrating love. He encouraged us to change the world. There is no better way to honor Michael than to make positive changes wherever we can. One of the ways we can make an important difference is to work for a law to be passed that makes it illegal to defame the dead. The freedom of speech is a right that we all enjoy in the United States, and to lose any part of that freedom would be a travesty. However, with freedom comes responsibility. Each of us has a duty to be honest, fair, and balanced in what we say. Journalists, those from whom the masses get their information, should he held to an even higher standard. It is ugly enough to attack someone while they are here, but to continue to promote old lies, innuendo, and hate once they can no longer speak for themselves is reprehensible. It is because of these men such as Trayvon Martin and Michael Jackson that we decided to turn this into a National effort, finding the longer it is delayed the worse the situation becomes. We believe the AdLLaw Initiative is important. We hold dear our First Amendment rights, but there is nothing in our Constitution about slander being a right or an acceptable example to set for our children. We were working to have California Civil Code §§ 44-48 revise the definition of who can be defamed to include “a natural person whether living or dead”. An initiative measure was been written by the Judicial Counsel (Initiative: Libel or Slander: Decedents – #1212737). 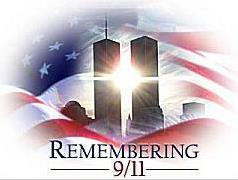 (b) (1) Defamation of a person may occur whether that person is living or deceased. (2) An action for defamation of a deceased person may be brought by any individual who would be entitled to succeed to any portion of the deceased person’s estate that passes under Chapter I (commencing with Section 6400) of Part 2 of Division 6 of the Probate Code, or its successor. A defamation action shall not be brought for defamation of a deceased person occurring more than 70 years after the death of the person. SEC. 2. This measure may be amended to further its purposes by a statute, passed in each house of the Legislature by rollcall vote entered in the journal, two-thirds of the membership concurring, and signed by the Govemor. Do you believe there are boundaries the Media and the public should not cross when it comes to the dead? On July 12, 2013, a full body picture of Trayvon Martin as he lie dead appeared on several social media pages, websites and YouTube videos. This photo is not blurred. The photo is part of the video footage from the courtroom fed to the Media pool. It was briefly televised by MSNBC. It became Internet property when it was published as part of a commentary on a site called Gawker. Could you accept thousands, tens of thousands or millions looking at anyone whom you cared about as they lie dead? How would it affect you to have such a photo reproduced over and over again until it is a common item on the Internet; one which you could come upon without warning at any time? Could anyone justify to you their reasons for turning such a photo into a source of curiosity or entertainment? Do you believe people should be able to use death photos to mock the deceased or as means of financial gain? OUR MISSION: Organize to protect and preserve, publicly, the legacy of those deceased and propose that all states/countries having defamation/slander civil codes be changed so that defamation applies to a “natural person whether living or deceased. OUR GOAL: Seeking support for a bill that would make it unlawful to defame a person who is deceased. Slander and libel are not protected under the First Amendment while a person is living. The same protection should be extended to a person after they are deceased. The loved ones of someone who has passed on should not have to live with the continued defamatory stories and false accusations that can so easily be paraded as fact. Please support the CadeFlaw Initiative. We need people to send letters or emails to the California Representatives. We need people who know people in California to help get the word out, to sign the petition. Note: Neither this writer nor CadeFlaw’s intent is to exploit the tragedy of this nor any other person by telling their story. A Story of Defamation: What Qualifies? To better understand defamation, we must know how the law defines defamation (libel & slander). Harry and Tom were brothers and partners. They lived in a place called AnyTown located in AnyState, USA. Since childhood they had fought over money. Tom said Harry spent too much and Harry said Tom was cheap. Their last fight was over expanding the business. Tom believed the time was not right and the money would go to waste. Harry believed Tom’s penny pinching ways were going to keep them from staying competitive. They argued in front of anyone who was around and complained to everyone who would listen. Their last argument took place in front of a new customer. Harry said: “Tom you are so cheap and stubborn I could choke you. You are going to ruin the business and then we will be sorry. The customer who was not accustom to business people shouting at one another left without doing any business with the brothers. On the third day of Tom’s absence, the Police met Harry at his home. He was arrested. They had found Tom buried in Harry’s garden. He had been bashed in the head. An anonymous tip had led them to the garden. Harry was an avid craftsman hobbyist. He never met a fancy tool he did not like or buy whether he could use it or not. A hammer was found in his work shop it had Tom’s blood on it. During the trial which would find Harry not guilty it was discovered the blood was Tom’s but it was too old to fit the timeline of the crime. The new customer who had testified against Harry had to admit Harry said choke not bash. Several family and friends would testify the brothers always fought and loudly but were quick to make up. After the trial there was the usual round of news specials where pundits retried the case, with comments from people who were witnesses and those who had not witness anything. Because of the trial, the accusations, the articles and public comments Harry lost the business and was forced to move to another State where he hoped they remembered little about his highly publicized trial. Which if any of these statements defamed Harry and which were opinion? Late night TV personalities would joke about the next guy being careful about taking on a partner from AnyTown, in AnyState USA; who had a liking for hammers. • Harm or damage to the plaintiff. Part I: A Story of Defamation: What qualifies? 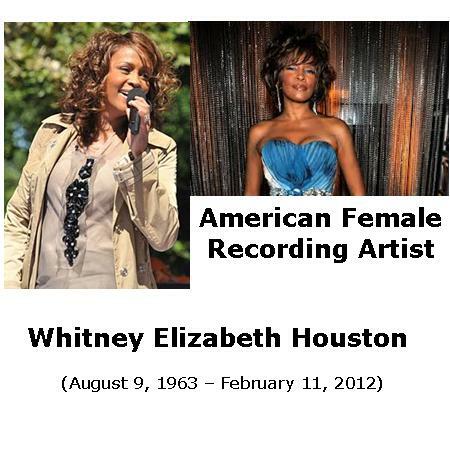 Whitney Elizabeth Houston (August 9, 1963 – February 11, 2012) was an American recording artist, actress, producer, and model. In 2009, the Guinness World Records cited her as the most awarded female act of all time. Houston was one of the world’s best-selling music artists, having sold over 200 million records worldwide. She released six studio albums, one holiday album and three movie soundtrack albums, all of which have diamond, multi-platinum, platinum or gold certification. Houston’s crossover appeal on the popular music charts, as well as her prominence on MTV, starting with her video for “How Will I Know“, influenced several African American female artists to follow in her footsteps. Tabloid fighting “defamation” since photos of Whitney Houston in her casket were released. Publishing the Whitney Houston casket photo on its tabloid cover has backfired on theNational Enquirer. The publication has a new battle on its hands now that a big name celebrity has claimed they did the same thing to her father. 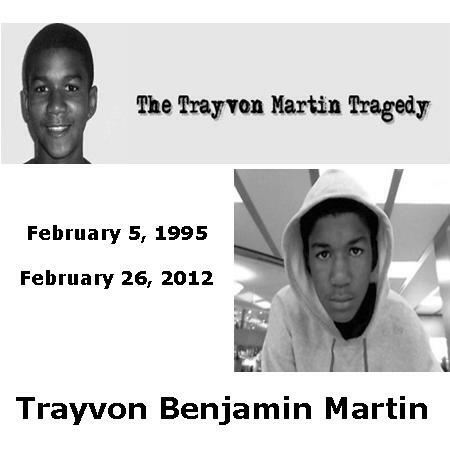 Trayvon Benjamin Martin (February 5, 1995 – February 26, 2012) was the son of Sybrina Fulton and Tracy Martin, who were divorced in 1999. He was a junior at Dr. Michael Krop High School and lived with his mother and older brother in Miami Gardens, Florida. Trayvon Martin, a high-school junior from Miami who was visiting family in a gated community in Sanford, was shot to death last month when he encountered George Michael Zimmerman, captain of the neighborhood-crime-watch group. 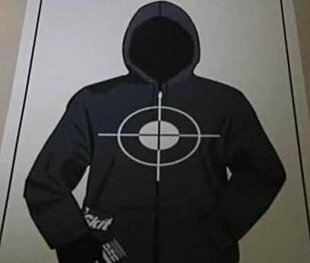 A shooting range target of a person in a hoodie with cross hairs on the chest, a bag of Skittles tucked in a pocket and a hand holding a can resembling iced tea was pulled from an online sales site, a Florida TV news station reports, but not before raising concerns of its connection with teen shooting victim Trayvon Martin. Michael Jackson – Most emotionally battered personality in the “World’s” media outlet before and after death. Since June 25, 2009, there have been many wonderful and loving tributes to Michael Jackson. There have also been unkind, untrue, and hateful references to Michael. Protecting and preserving the truth is the reason for this initiative. We are disgusted and frustrated with the amount of rubbish that continues to be paraded as fact about Michael Jackson. In looking for a way to stop the flow of distortion, we learned that there is nothing to stop the defamation of someone who has passed on. 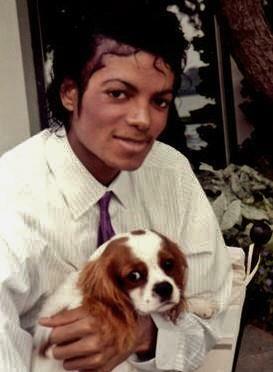 Michael devoted his life to demonstrating love. He encouraged us to change the world. There is no better way to honor Michael than to make positive changes wherever we can. One of the ways we can make an important difference is to work for a law to be passed that makes it illegal to defame the dead. The focus of this effort is to have such a law passed in California, because that is where Michael spent much of his life, and where his family lives. 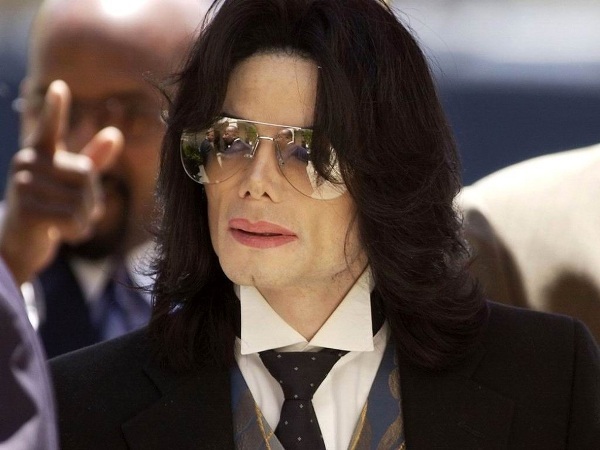 Although the viciousness toward Michael has eased, the residue of tarnish on his name and reputation remains. It is time for us to Make That Change. The life and legacy of Michael Jackson should be celebrated with respect in the United States, and around the world. We are all familiar with the level of unfair media attention heaped upon Michael in the past. Journalists hid behind freedom of speech in an attempt to destroy Michael Jackson for entertainment and profit. The freedom of speech is a right that we all enjoy in the United States, and to lose any part of that freedom would be a travesty. However, with freedom comes responsibility. Each of us has a duty to be honest, fair, and balanced in what we say. Journalists, those from whom the masses get their information, should he held to an even higher standard. It is ugly enough to attack someone while they are here, but to continue to promote old lies, innuendo, and hate once they can no longer speak for themselves is reprehensible. We will no longer passively accept this disrespectful and cruel assassination of Michael’s name and any other deceased person(s). It is time to come together and take action. The time is NOW. If you would like to see a law put in place that would prevent the media from feeding on the reputations of those who have passed on, please sign the Cadeflaw petition. There is strength in numbers, and many voices create a mighty roar.